A picture of the order of the tightening sequence for the Aluminum DOHC valve cover. This does not apply to the plastic valve covers... Tighten to 89 in-lbs..
And thare actually is a sequence for the comosite covers as well, its the same as the aluminum ones. At least thats what the FSM says. This is the pattern for the 11 bolt composite cover. I replaced my leaking valve cover seals today, and discovered that the cause of the leak was due to the injector wiring harness being previously trapped under the valve cover seal! Unbelievable. Unfortunately, I snapped the number 1 bolt before my torque wrench reached 89Lbs. It snapped clean off at the top of the head, so I can't grab it with a vise-grip. What is the best method for removing the remaining piece of the bolt? 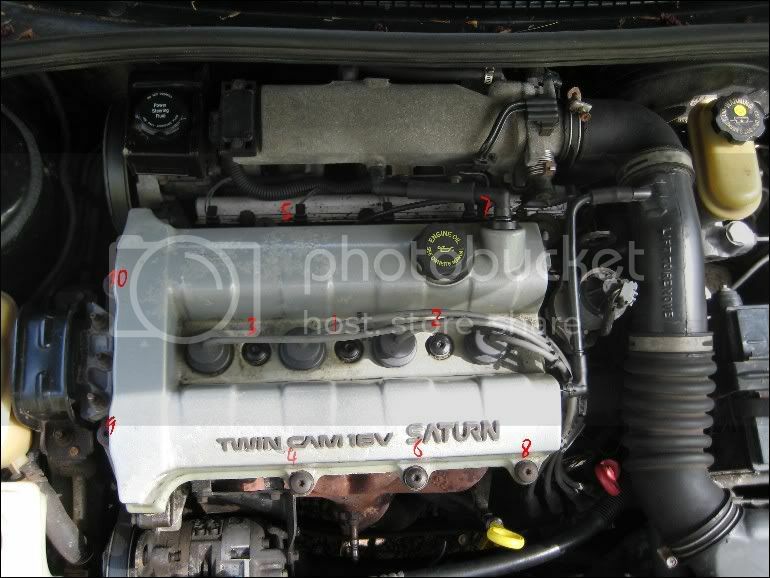 1996 Saturn SW2 DOHC - Phenolic Valve Cover, Original Bolts. Rate the quality of this post and help squeeker reputation points. Click the reputation button near the bottom left corner of this message box. Thank you! The torque spec is 89in-lb. That might be why it broke. How far down in the head is the broken bolt? You can drill a small hole in the end of it and use an easyout on it if you are good with a drill. The other approach is to cut a slot in the end of it with a Dremel tool and take it out with a small screw driver. If you cleaned out the holes before you installed the bolt it will come out easy. You might nick the head with the Dremel but you can patch it up with JB Weld, or a dab of RTV. Whatever you do not break off an easyout in the bolt as they are almost impossible to remove.